Stat of the day: £50m. UK pig farmers have struck a £50m trade deal to sell their pork to China. That's some serious coin(k). After five year's of trade talks, UK farmers have finally sealed a deal to supply pork to China, the world's biggest market for pig meat. Its a real coup for pig farmers on two fronts. Firstly, China is the most lucrative grocery market in the world and establishing trade links will ensure the future of the UK pork industry for years to come. Second, Chinese diners eat parts of the 'fifth quarter' of the pig - things like offal, trotters and snouts - that are often thrown away in this country. Everything but the squeak, as they say. This allows pig farmers to make more money per pig than they can in the UK. 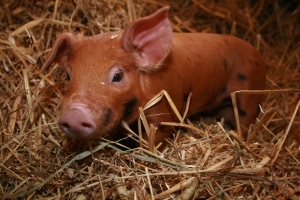 The first consignment of British pork is already being prepared for dispatch by Tulip, the UK’s biggest producer. If everything goes to plan, the new deal should generate some £50m for British pig farmers each year.